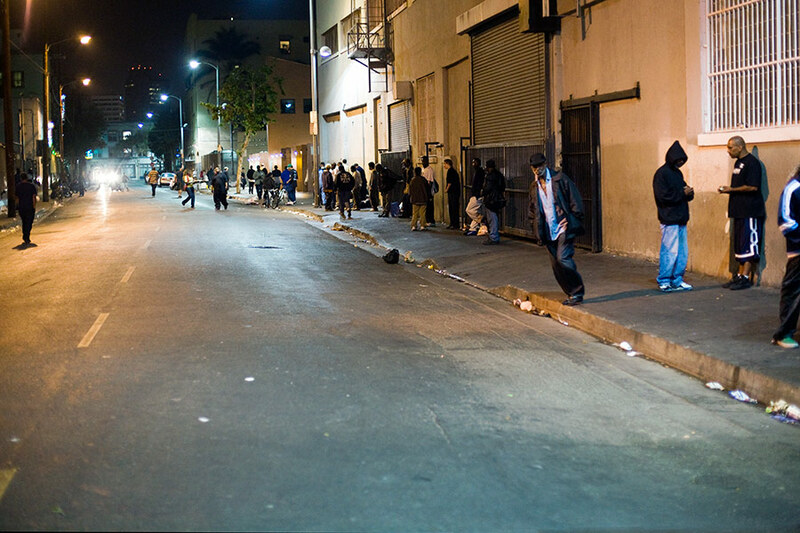 A scene from Skid Row in Los Angeles. Why is it that in a city that is prepared to spend up to $50 million dollars vainly trying to capture the Olympic games (for the third time) there are over 25,000 people sleeping on the streets on any given night? And, why is it in a place that will soon be home to a half-billion dollar, 100,000-square-foot mega-mansion, there is not enough affordable housing? Los Angeles now has the ignoble status of failing to house more dispossessed people than just about any other major city on the globe, coming in third after Manila (with more than 70,000 homeless) and New York City (with more 60,000). More than 44,000 homeless people were counted in January 2015 across Los Angeles County, with nearly 26,000 in the City of Los Angeles alone. And the numbers keep rising; the city’s homeless population has jumped by double digits for the better half of the last decade, while funding to combat homelessness has shrunk. Astonishingly L.A. has also become home to billion dollar mega developments like Greenland’s Metropolis in downtown, which, according to some, may end up being L.A.’s first zombie development, its condos pre-sold to foreign investors and then left largely unoccupied. Visible divisions have formed: Will Los Angeles be the 21st century capital of the Pacific Rim (one long held political fantasy about the region) or the capital of the Third World (another thesis about L.A. put forward by David Rieff, Mike Davis, and others)? Which one is our reality? Probably both. Blocks away from City Hall there are people living in tents, in cardboard boxes, or just sleeping unprotected on the sidewalks and in the gutter. How it is that we can tolerate, let alone ignore, what amounts to an unofficially-sanctioned human rights violation district right on the footsteps of the city’s political, cultural, and economic heart? We live in one of the wealthiest cities in the western hemisphere (22 billionaires call L.A. home) and in a U.S. state that has more billionaires than every country in the world except China. The city covers 469 square miles with a population of 4 million people, within a county that sprawls for 4,058 square miles and contains almost 10 million people, and Los Angeles can’t meet the needs of less than one fifth of its homeless on any given night. Despite this calamity, only weeks ago the City of Los Angeles effectively failed to declare this situation a national—let alone a civic—emergency. Money has been pledged by City Council to address the matter ($100 million apparently) but no source for that funding has been identified and it seems that no analysis has been done to determine if that amount is even enough to stem the flow of the dispossessed onto our streets. While next year the city will budget almost $30 million dollars to pick up trash, clean alleys, and fix the city’s sidewalks, Los Angeles’s affordable housing fund, which in 2008 totaled $108 million, plunged to $26 million in 2014. To date, L.A.’s fallback solution in dealing with the homeless is not to address the gap between our homeless population and available emergency housing from a social policy or urban planning perspective but to leave the matter to the Los Angeles Police Department, an organization that couldn’t be more poorly prepared for the job. Having both declared a war on homelessness and signed an ordinance effectively criminalizing homeless encampments, our City has, de facto, made the LAPD the first line of response against the helpless. In June of 2015 the Los Angeles City Council approved to two ordinances allowing authorities to quickly dismantle encampments in parks and on sidewalks. At a minimum this is negligence. 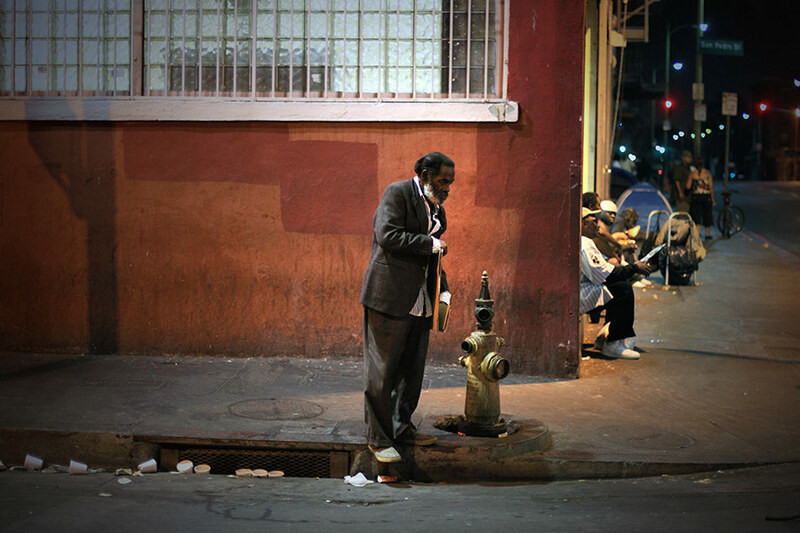 L.A. spends $87 million of taxpayer money annually to issue citations for vagrancy and to harass and remove the homeless and their belongings from sight. In more extreme cases it seems like criminalizing the homeless is reckless if not inhumane—we allow an organization notorious for its historic brutality against a variety of disenfranchised groups to be pitted against the weak and the mentally unhealthy. In two recent incidents across the city, LAPD-led confrontations with the homeless have ended in tragic deaths that will in turn lead to multimillion-dollar lawsuits. Imagine if this money was redirected towards the construction of single room occupancy (SRO) housing or spent on reconfiguring existing buildings and properties into emergency housing. For ten years of policing the homeless (or about $900 million dollars) could pay for about 40 SRO apartment buildings, each with one hundred 350-square-foot units. That is to say, we could house 15 percent of our current homeless population for the same amount of money we waste issuing tickets, harassing the indigent and arresting the abandoned and the discarded amongst us. Homelessness is our housing shortage in extremis. L.A.’s ineffectual and discomforting approach to addressing homelessness is just the most visible aspect of a retrograde and, frankly, embarrassing lack of creative thinking around the challenges of providing decent affordable market rate (forget innovative) housing for an expanding population. In a region that virtually pioneered the single family modern home, we can’t seem to expand that vision to a larger social vision. Schindler, Neutra, Ain, and Entenza would be ashamed. During the 40-year period following the end of World War II, some four million housing units were constructed in Southern California, with more than 1.5 million of those being multiunit buildings. That is to say: Roughly 100,000 units, both single family and multi-family, were built every year until the end of the 1970s. This is the same ageing housing stock we are partly continuing to recycle as monthly rental units or, increasingly, as nightly Airbnb bookings. Today, a time when the state’s population is projected to grow by 38.4 percent in the next decade, we are building less than one quarter to one half of the volume of postwar housing. According to the city’s own Housing Needs Assessment, L.A. will need to produce about 5,000 units a year moving forward to solve the housing shortage. Instead, we are barely grinding out a thousand new units a year and of those most are not affordable to those making less than $40,000 a year. While well over 50 percent of the population in Los Angeles now rents rather than owns (and on average those renters spend well over 40 percent of their income on rent) nothing is being done to meet current, let alone projected, housing needs. By 2025 Los Angeles–Long Beach will average an estimated 6,450 people per square mile, the densest in the nation. The question that remains is not only how will we meet the housing needs for this increasingly dense urban landscape but, how many of us will also soon be one rent check away from the streets? To his great credit, Los Angeles Mayor Eric Garcetti wants to build 100,000 new housing units by 2021 to address the city’s housing shortage. Predictably, a new form of anti-growth and anti-density populist activism has emerged to check the mayor’s plans. The group The Coalition to Preserve L.A. has raised the specter of a ballot measure that would create a total moratorium for any development project requiring a City Council vote in order to increase the number of housing units allowed on a particular site. Given how many urban redevelopment sites probably don’t conform to higher density as of right now, this might translate into hundreds if not thousands of new units that won’t get built annually. To make matters worse the outrage around density is not assessed in terms of facts on the ground, like actual population dynamics, but in terms of planning and building codes that were written a half century or more ago in support of a suburban vision of L.A. that went the way of the atomic age. The emergence of the housing moratorium is not surprising given Southern California’s long history of blissful suburban ignorance. With increasing public hysteria around density has been building since at least the 1990s, it is only the virulence and folly of this latest form of NIMBYism that is so deplorable. Under the guise of maintaining the “integrity” and “character” of communities (read preserving property values and excluding the less advantaged) the seemingly populist (but probably conservative and privately backed) The Coalition to Preserve L.A. is fighting hard against the Manhattanization of Hollywood under an oddly bureaucratic banner. Officially, their initiative is titled “Restrictions on General Plan Amendments, Required Review of General Plan; Building Moratorium Initiative Ordinance,” a generic title for a piece of legislation that would quite likely exacerbate if not permanently extend L.A.’s housing shortage crisis in perpetuity. A Potemkin City or a City of Hope? If there was an allegory here it might be that Los Angeles, as seen from the air by a visiting dignitary is now effectively a giant Potemkin Village, a decorated city that is teetering on several hollow constructs: firstly, that this is a globally significant metropolis capable of managing its growth competently (let alone staging an Olympic event or two); secondly, that the clichéd image of L.A. as a suburban paradise—so well-abused to cover up its most intrinsic short comings: freeway congestion, social inequality, and unrest—will continue well in this next century and, lastly, that it is possible for the majority of the population to continue to pretend that the very evident homeless crisis that now bridges Skid Row and Venice can be wished or policed away. The confluence of poor or postponed policy decisions, our inability to generate innovative and effective housing models along with a near maniacal public that won’t accept growth and density as inevitabilities (and not just political options) spells out a future that looks increasingly miserable. Yet, there is hope. In early January of this year, California State Senate President Pro Tempore Kevin de León proposed to spend $2 billion dollars to build new permanent housing or rehab existing housing for mentally ill people living on the street. This is a step in the right direction but we desperately need more local solutions that are impactful, innovative, and effective. L.A. remains a city with a future so long as we work on it in the present. Fixing and upgrading our existing housing stock and building new housing, for both the homeless and our workforce alike, is foundational and will form the moral and political keystone for a path toward a more civilized urban future in L.A., one based on an fair distribution of our urban resources. Rampant homelessness in a city overflowing with excessive wealth is not only morally unacceptable but will surely eat away at our ability to address other challenges Los Angeles will face, key amongst them how will we create equitable, enduring housing solutions for everyone, not just the privileged.